A pretty basic program. It will check the contents of the header of an iNES rom. This program follows the iNES format as closely as possible, and bytes that are reserved to be 0 will be set to 0. 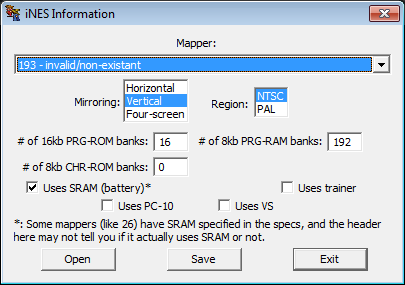 Some roms use SRAM even though the header does not mention it (some MMC3 and MMC5 mappers, for example).